Swai white-flesh Fish Fillet; with a sweet mild taste and light flaky texture. Served with White Rice and mixed Steamed Vegetables. 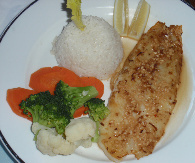 Swai white-flesh Fish Fillet; with a sweet mild, taste and light flaky texture, cooked with tasty Garlic Sauce. Served with White Rice and mixed Steamed Vegetables. Crispy Battered Deep Fried Swai white-flesh Fish Fillet; with a sweet mild, taste and light flaky texture. Served with White Rice and Steamed Vegetables. Grilled Shrimp (9 Pcs) with tasty Garlic Sauce. Served with White Rice and mixed Steamed Vegetables.